Red Dawn is a film that takes the Jeffersonian maxim that "freedom is risk" to the maximum. A man who is not free to take risks, or is not willing to take risks to be free, is never free. The movie begins outside of a small town's high school. A history teacher is talking of the past legacy of mongal hordes and the killing frenzies that they would unleash on their enemies. In the class there are a number of prominent football players including Jed (Patrick Swaze.) He is the towns favorite football player. Through the windows of the school, parachutes appear in the sky. Troops land, and everyone assumes that some US army training mission has sent its particpiants way of course. The history instructer heads outside to try to find something out about this spectacle. Soldiers unveil generators and large weapon caches and immediately open fire, killing the instructer. Troops then fire into the school. Students head for a place to hide, with many unsuccesful in this endeaver. Jed and other football players escape in a truck that is forced off road by a road block. A tank turret trains directly on them and prepares to unleash a flurry of bullets. At that moment a US Helicopter flying over head destroys the tank with a flurry of small missiles. The battle lines it appears are coming into focus. Its the Russians allied with Cuban and Nicaraguan forces laying seige on America. This is to be the Red Dawn that separates the free and the brave from the cowards and the vanquished. Jed, the football captain takes a number of teenage friends to the mountain areas near by to hide out. He has a strategy of waiting things out, and living off the land he learned to hunt and fish from when younger. The group that hides in the mountains bonds and lives tranquily but in fear. On one day a trio of Russian soldiers approaches a nearby mountain monument. The troops are acting more like tourists than soldiers but one can never be too careful. Jed leads an attack. With inferior weapons including a bow and arrow the group overwhelms and kills the three Russian soldiers. As time goes on, the group would become a legend. The would become known as the Wolverines; the ultimate citizen soldiers. The Wolverines before were the name of the towns school football team, but now the name was to be one of freedom fighters. 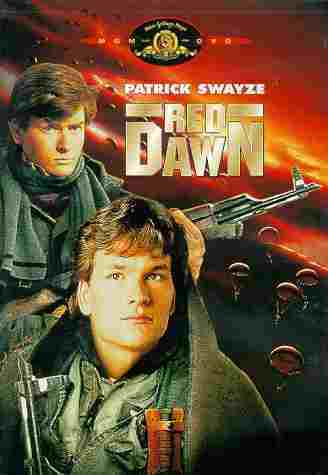 Red Dawn shows the frontline Gureilla war tactics that it takes to win wars. The movie illustrates the power of surprise, dedication, and member loyalty within a group. No tyrant or standing army can ever match such a combination. Originally the movie was to be known as Ten Soldiers as the movie entails the fighting spirit of ten citizen soldiers.. Red Dawn is a movie of catch phrases, and quotes that have left a legacy for the minds of the free. The movie left one quote that burns into ones conciousness, "We're all going to die, die standing up." This is the motto of the free. Rather in life or in death, freedom exists because of the selfless risk, attention, and constant enlightenment pursuits that drive the minds of those whom truly serve as the guardians of freedom. The guardians of freedom it seems seldom enjoy the freedoms for which they fight, or seek to enlighten their fellow man about. This is true in the movie as well as in life. In the movie all but two of the original child soldiers dies. Those who know freedom best either die for its restoration, or live life dedicated to its continual preservation. To many the movie represents an "urban myth," or a self delusional fantasy that inspires paranoi in the supposedly "civil citizens" of this "civil world." But to many the movie represents the ultimate human myth that we all want to believe in. That being that people care for each other, that things matter beyond life or death, and that some will dedicate their lives for such ideals. This would be the notion of the citizen soldier, the ultimate defender of everything from the ideals of Republic's; to the ideals of justice; to the ideals of the human soul. Red Dawn is a movie of action beyond compare, that intermingles action with purpose. The end result is an artistic work that encourages self reliance, belief in the individual, and in ones neighbors.